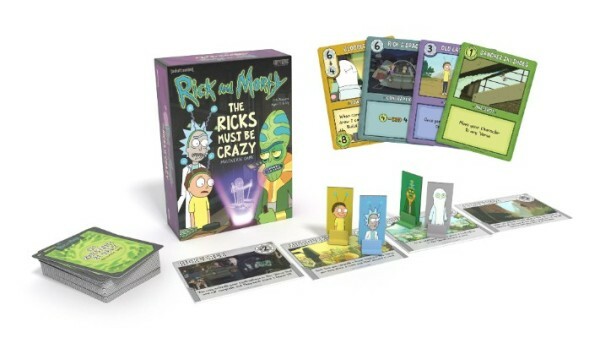 Lake Forest, CA – May 14, 2018 – Cryptozoic Entertainment, leading creator of board games, trading cards, and collectibles, and Cartoon Network Enterprises today announced the May 30 release of Rick and Morty: The Ricks Must Be Crazy Multiverse Game. In this engine-building tabletop game, 2-4 players take on the roles of Rick, Morty, Zeep, and Kyle as they introduce Power Supplies to different worlds, and then try to use the resulting Power to activate Contraptions before their opponents. Based on the Rick and Morty episode “The Ricks Must Be Crazy,” gameplay takes place in four “’Verses” with unique attributes: the Rickverse, Microverse, Miniverse, and Teenyverse. Cartoon Network Enterprises (CNE) is responsible for building consumer products and merchandising programs for a wide range of brands by securing and supporting long-term licensing partnerships across all categories. As the global branding and merchandising arm of Cartoon Network and Adult Swim, the division manages the consumer product programs for the network’s award-winning original programming, brands and characters including Ben 10, Adventure Time, The Powerpuff Girls, Steven Universe, The Amazing World of Gumball, Mighty Magiswords, and We Bare Bears, as well as Rick and Morty on Adult Swim.